Does your cat need a workout? (Is he getting a pot belly? Or is she making bigger dents in your couch than she used to?) 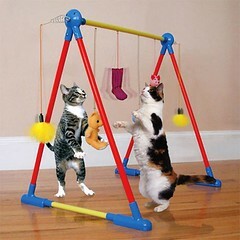 Time for your kitty to get a workout with the Kitty Kat Circus Interactive Gym. The gym holds up to six cat toys and stimulates your cat while he gets those abs of steel. No pain, no gain. This entry was posted on Sunday, May 20th, 2007 at 3:50 am	and is filed under Cats, National Dog, Cat & Pet Info, Products & Services for Cats & Dogs. You can follow any responses to this entry through the RSS 2.0 feed. Both comments and pings are currently closed. I dunno, but that looks like Overstimulation to me, mu cats might run (which in turn, leads to weight loss).